This blog provides you an overview of the key highlights in finance for our SAP S/4HANA 1709 release. Covering many innovations, we’re bringing tremendous value to finance organizations. The last release SAP S/4HANA 1610 focused more on process readiness for the finance function by providing optimized and robust business processes across all capabilities, highly integrated with the optimized logistics. Now, with SAP S/4HANA 1709 we deliver on top additional embedded analytics capabilities, enhanced real-time accounting and closing capabilities, innovative cloud apps on the SAP Cloud Platform and most importantly: first machine learning scenarios for finance. Let’s start with Central Finance. There is a new Fiori app available which allows you to see the related documents from Central Finance perspective. Within this app, you can even drill-back to the source document. Central payment for SAP Central Finance allows you to make centralized payments and perform centralized clearing activities in the Central Finance system instead of each source system. With 1709, we also included a VAT configuration check for company code. This enables you to activate an enhanced check for tax related postings. With Central Payment, this check is mandatory. In Central Finance, customers typically ask how they can replicate costing-based CO-PA in the SAP ERP source system into account-based profitability in SAP S/4HANA. This scenario is not supported out-of-the-box yet. In the interim, with SAP S/4HANA 1709, a tool-set is provided to support this replication as part of a custom implementation project. This available tool-set includes: CO-PA mapping tool & an enhanced replication method. With our new release, we’re also delivering several enhancements such as the Fiori app for financial planning & analysis to support product cost analysis. We have now included a work center view, which doesn’t only show the actual cost at work center at non-operational level, but also the planned data. Furthermore, we’ve made some progress in profitability analysis in the Universal Journal. We’ve enhanced the splitting cost of goods sold in SAP S/4HANA, and are bringing a reporting app for realignment results. These enhancements help to create more transparency for our customers. Another great feature in planning is the new workbook content to plan the cost of goods which are manufactured. Semantic tagging & flexible hierarchies are very new innovations. The latter are based on master data attributes and tags. These two innovations are designed to flexibilize & facilitate the overall reporting capability. A third area I want to highlight is ‘Accounting and Financial Close’, where we have already G/L line item and which divided into posting and reporting view. Highly desired by our customers, we are now supporting the subsequent introduction of document splitting. 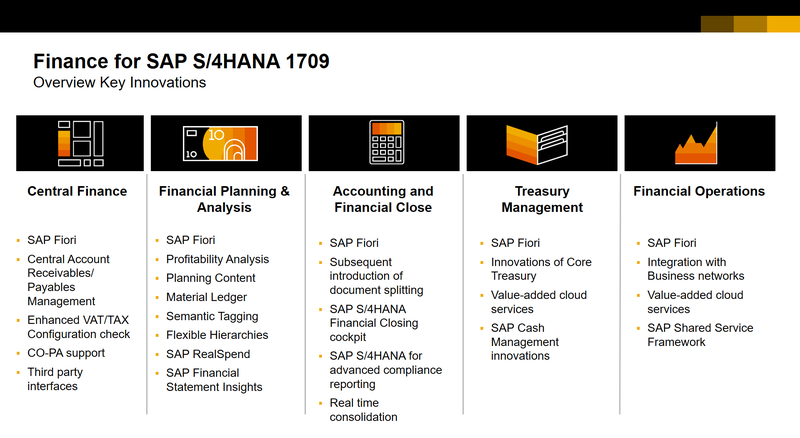 To achieve faster entity close while meeting regulatory requirements, the SAP Financial Closing cockpit is now a core part of SAP S/4HANA 1709. 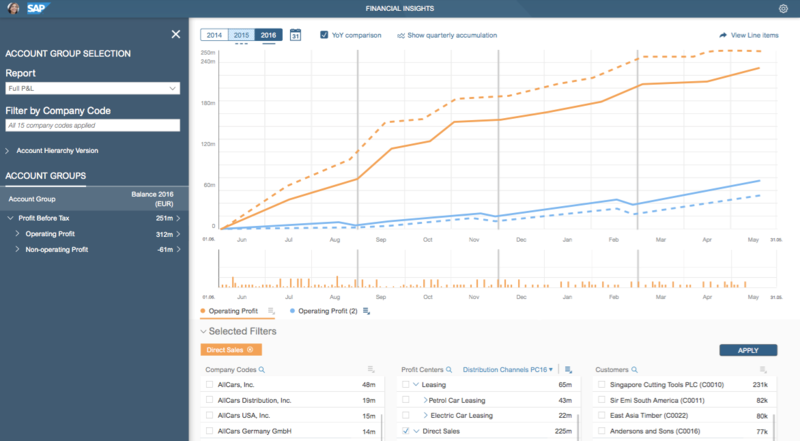 It supports in planning, executing, monitoring, and analyzing financials closing tasks for the entities of your group and creates insights instantly. It can also be used for periodic recurring activities with the involvement of multiple agents. The advanced compliance reporting provides a new framework that helps meeting critical compliance reporting requirements for the various accounting principles. With this release, the workflow functionality for bank account management is redesigned so that it now includes a new workflow template, new apps for processing and tracking workflow requests, and a new app called “Manage Workflows”. In Cash Management, the cash flow analyzer supports different variants and different hierarchies like cash position detail analysis, liquidity item hierarchy view, and more. Finally, I would like to emphasize Financial Operations in 1709. We have four SAP Cloud Platform apps available now with our SAP S/4HANA 1709 release: SAP Cloud for credit integration, SAP Cloud for customer payments, SAP Cloud for digital payments and SAP cash Application. They all support the end-to-end process by delivering dedicating Cloud services. I am preparing the architecture for Central Finance on S/4HANA 1709. Question, are you or any colleagues able to help, and this can be useful for other readers, does SAP provide any documentation for Central Finance on S/4HANA 1709 describing the options which Customers can use to replicated / transform data from the sources systems (SAP and non-SAP) into the Central Finance system ? I am not able to find useful documentation so far. ok, this Note https://launchpad.support.sap.com/#/notes/2464583 its Attachment say it is possible.